This item is used to open the door to King Beltron's room. Kind of old info, but it isnt posted here yet! 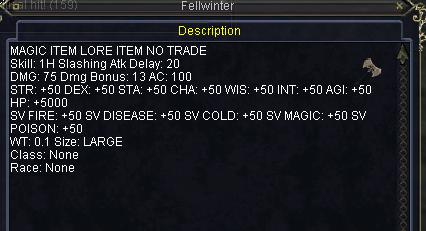 Fellwinter is dropped 100% of the time from Harfange the Black. It's used to unlock Beltron, The Shade King's door. The item is unequippable (of course). The item will disappear out of your inventory when you click to open Beltron's door IF you attempt to kill Beltron in the same night that you kill one of the other bosses. If you go back to try Beltron only (like a new instance with none of the other raid mobs up and all the trash at the entrance repopped), then Fellwinter will not be consumed when opening Beltron's door, though it's still required. Well long, long ago you could give no drop items to pets and they would equip them. The item he linked was from Fabled Charasis. I don't recall when they stopped letting you give no drop items to pets, nor do I know when Charasis first went Fabled, but I suspect he isn't lying. I still remember way on back when i was in my 40s and after everyone would pass on a no drop weap, and noone in the zone wanted it, the necro friend would always give it to his pet. I'm not sure why they changed it so that pets destroyed no drop items. However I did once meet a guy in Felwithe who demonstrated an obscure way in which he could turn is own pet into a mob and kill it. He never told me how he did it, and still to this day I don't know what he did. I also don't remember if it left a corpse, however it's possible that it did, and that that's the reason for the nerf. I'd love to know if anyone else encountered this exploit and know how it was achieved. maybe when teh aniversary for eq where this mob would be a fabled this wepon will be usable like the fabled sword or truth? Maybe if your able to disarm the guy his dps will go down? You're not mistaken. You cannot disarm magical weapons. However, you CAN disarm no drop weapons, just so long as they aren't magical. So far we believe it is used to open the final door to get to the Shade King. Just havent figured out how to use it completely yet. This drops off of Harfange the Black in Frostcrypt raid instance #2. It's just what the Mob himself uses, and only he can use it. Same as Sword of Truth (as mentioned) but then Seru used that and it's old now. I think it's cool to see their weapons. Gives the mob its self an even more "mighty" feel. Race: None... What's the point? NO TRADE so it can't be used as a pet item either I don't think... weird. Can ANYONE classify what the point of this here thingymabobber is? I've given No Trade items to my dog dog on several occasions. Items such as Fabled Obtenebrate Short Sword. I was soloing, nobody else was in the zone, and none of my online guild and guild alliance members were interested in coming out to fetch it, so what better use was there for it? Saved me from having to root most mobs too. Same as the Sword of Truth, its for link value only.